We are into week two of our Christmas unit. The kiddos and I LOVING it. I purposely planned weekly unit studies that were not about Christmas Trees, Santa Claus, Rudolph, Frosty, etc this year. Christmas carries many PTSD triggers for Princess. The less we focus on the traditional kiddos stuff, the better she does. As she becomes more comfortable with our family traditions, and how they are different than what she experienced previous to our home at Christmas time, (Most and the worst abuse occured during the Christmas season and winter.) we slowly introduce more. After mourning the loss of the magical Christmas holidays I remember as a child, that I so desperately wanted to share with my own children, (They only result in extreme behaviors, screaming fits that last for hours, and the destruction of one or more items and/or rooms.) I've started to embrace the changes we've made in traditions and home decor. After all, how many parents can say their children, ages 4, 5, & 6 LOVE The Nutcracker? Such is the same with A Christmas Carol. I couldn't be more proud, for I love both stories. Planning this unit has been quite a challenge. Usually I can find at least a few free printables or ideas from other blogs or Pinterest, but not this week. This theme is not as popular as I would have thought, especially for kiddos ages 4, 5, & 6. I have spent many sleepless nights trying to think of ideas for activities to fill our shelves. Even now I'm not 100% satisfied with the result, but the kiddos like the activities, and I ran out of time. Knowing we'll be covering the same topic next year brings me comfort. I have plenty of time to come up with a more well rounded unit study. 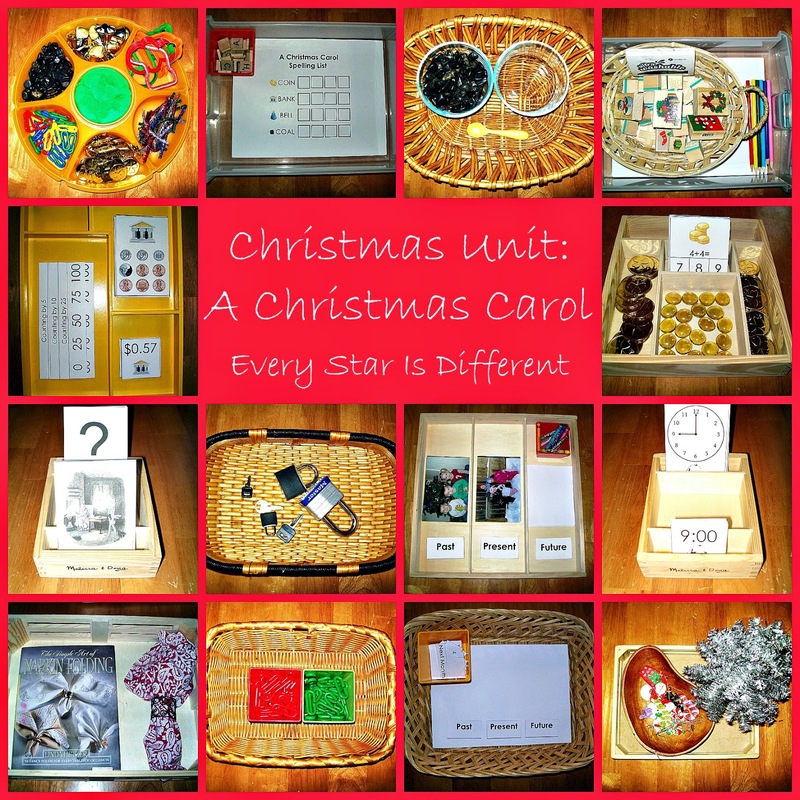 I had no idea A Christmas Carol would inspire so many math activity ideas. It was not my intention to have this activity back on our shelves again so soon, but Bulldozer loves it and is thriving with it. It's amazing to me how writing a letter, using his finger, in a salt tray, makes such a difference in preparation to writing his letters, using a pencil in his journal every day. Until Bulldozer gains more confidence and ability in his writing skills, I'm guessing this activity or something like it will remain on our shelves each week. Source: The free letter cards can be found at Homeschool Creations. Originally, I had wanted to use letter stamps for this week's spelling list, to teach and explain to the kiddos, how books were printed in the past, but I don't have letter stamps and didn't want to spend the money on them this month, with the holidays and all. Hopefully by next Christmas I'll have some. Instead we're using Scrabble pieces. There are two sets of words. The easy set is shown in the picture above. Source: I created this activity. For your free copy, click on the link to the printable pack located at the bottom of this post. My kiddos have an extremely hard time thinking and speaking in terms of things that happened in the past, present and future. Bulldozer has significant struggles with anything that isn't in the moment. I wanted to have an activity that would help them learn the difference between the past, present, and future, using terms they tend to mix up on a regular basis. The activity was harder to create than I thought. I almost gave up and just used verbs. Thankfully, when I presented what I had finally come up with to the kiddos today, they LOVED it. It turned out perfect. When I presented the activity today, I had the kiddos place the different slips under the different categories, in no particular order. The control is for them, when they do the activity on their own. Dinomite has been begging me to teach him cursive letters. This week I put out an introductory activity, just to see what he thought of it. I couldn't get a picture to turn out, as the activity was a laminated, shiny place mat. As an introduction to the activity I decided to show the kiddos what their names look like in cursive. WOW! It has been a long time since I've written anything in cursive! I think I may have to do some practicing before I teach the kiddos anymore. I'm a print or keyboard type of girl. I couldn't resist number writing practice when it comes to Ebenezer Scrooge and his clerkship. This isn't a new activity, but it's great review. Source: The printable for this activity are free at Homeschool Creations. Bulldozer is starting to become quite proficient at sequencing four to five events. I was really impressed with how well he did today. Hooray for progress! I just love these cards. The kiddos sequence the four visitors Scrooge had through the night. As I watched A Christmas Carol in preparation for this unit, I noticed so many references to time and clocks. I couldn't resist a time activity. The kiddos will match up the time cards. There is also an option for them to write the times found on each card, when they're a little more comfortable with telling time. The kiddos were so excited about this activity, not necessarily for addition purposes, but for the coins. However, Dinomite and Princess did a fabulous job with their addition too. Bulldozer couldn't get past the coins. It's been a while since we've worked with money. This week was a great opportunity to review. The kiddos will match up coin cards with amount cards. I've provided counting control cards, in case the kiddos forget how to count their coins. Besides the printable pack, I've got to say, this is my most favorite activity on our shelves. I printed out a few pictures of the kids from years past at Christmas time, along with a few pictures from this holiday season. (We've already had two Christmas celebrations.) The kiddos will separate the pictures into categories of Christmas Past and Present. It doesn't seem that difficult, but Dinomite was the only one who understood at first. Once they've separated the pictures, they draw a picture of a Christmas future. It was super cute today. Princess drew a picture of her at Disney World for Christmas with Mulan. Dinomite drew a picture of him waking up super early in the morning to see what he got for Christmas. I couldn't think of any Scrooge related science activities. To ensure we have science related activities this week, I've pulled some older ones we've done in months past as part of our morning work. Dinomite is quite pleased, as some of them are animal activities. The kiddos continue to draw in their journals each day. They are also drawing their pictures of Christmas Future this week. The kiddos continue to practice their Christmas piano piece. Dinomite and Princess are doing fabulous with it. Bulldozer has the first line memorized. We continue to exercise as a family. It's been a lot of fun! The kiddos are enjoying these locks again this week! They're always a huge hit. Dinomite recognized what this activity was about right away. He was so excited and connected every link, just so he could walk around like Jacob Marley. It would have been super cute to have a mini stove or even a black box to use as a stove, but I didn't have one. Instead I just used our little black rocks and two bowls. Still the kiddo were super excited about it. This is a classic Christmas activity, that Princess is okay with. Each of the kiddos had fun with it today. We were supposed to do this last month, but with everyone sick, we didn't get to it. I must confess I'm a big entertainer at heart. This napkin folding book was given to me by a very special friend while in college. He knew of my love and passion for table settings. To this day, I think it's one of the most favorite gifts I've ever received. There are so many fun designs. Dinomite had a blast today testing it out. I purchased a bunch of Christmas stamps on clearance after Christmas last year. Dinomite and Princess were super excited about them today. Bulldozer loved this activity and played with it for quite some time. His first request was for me to help him build a fireplace for the coal. He then used the pipe cleaners to make a fire. I was so impressed with his creativity. There's just something about play dough he's always loved! For those who would like a free copy of my printable pack, click below. Enjoy! Your blog is one of my favorites! I love all of your neat activities and am grateful for your printables. Thank you! I love these ideas Renae. We will definitely be trying some of these. Thank you!